Cabela’s coupons and promo codes are key to saving on outdoor clothing, hunting gear, fishing equipment, and camping stuff from the online Cabelas catalog store. These listings of Cabelas coupon codes, promotional specials, bargain sales, and outlet deals may help you achieve cheap prices and deep discounts at the World’s Foremost Outfitter. We geeks spend a lot of time at our computers, and that’s why it’s important for us to get outside when we can to breathe the fresh air. Fortunately, Cabela’s catalog online sells all manner of gadgets to satisfy our techie hearts even while we’re enjoying the great outdoors. The store carries hunting, shooting, fishing, boating, and camping goods as well as auto and ATV equipment, home and cabin supplies, and outdoor clothing and footwear. Based in Sidney, Nebraska, this specialty retailer has been supplying the outdoor recreation market since 1961. Every hacker has a hobby that goes beyond just computers. 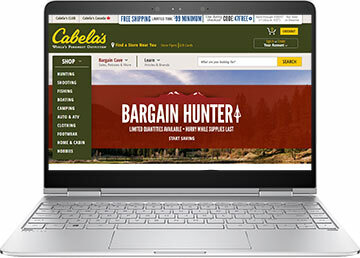 At www.cabelas.com, you’ll find board games, outdoor games and toys, shooting games and toys, how-to DVDs and videos, weather instruments, radios, rock polishing equipment, bird watching tools (including Bushnell Powerview compact binoculars), golf cart accessories, wine making and brewing supplies, and scrapbooking materials. Stargazers will appreciate their stellarscope in the astronomy section. If you really just want stay on the computer or game console, however, you’ll also find video games, including Cabela’s very own Big Game Hunts, Dangerous Hunts 1 &2, Cabela’s African Safari, and Cabela’s Outdoor Adventures. They’ve got great gadgets for the kitchen, including food grinders, slicers, food dehydrators, sausage making equipment, smokers, canning machines, jerky making tools, vacuum sealers, and knife sharpeners. For outdoor cooking you’ll find high-tech grills, backpacking stoves, and camp and blind stoves. They carry the low tech stuff too, of course, like cast iron stoves and dutch ovens. There’s portable technology for when you’re on the road or in the woods, such as generators, battery chargers, jacks, power packs, and thermometers. Outfit your boat, ATV, or car with GPS or radar detectors and other accessories. This sporting goods store is a great source for handheld GPS and other navigation devices. Get two-way radios, Swiss Army knives, headlamps, spotlights, and emergency radios as well. If you’re into shooting, Cabelas.com has black powder and reloading supplies, ammunition, optics, firearm components, air guns, hand guns, centerfire rifles, rimfire rifles, and shot guns. Hunters will get great deals on archery equipment, decoys, blinds, tree stands, scents, and scent eliminators. If fishing is more your style, you can browse a diverse inventory of rods, reels, bait, tackle, and fishing line. Campers will enjoy discounts on tents, sleeping bags, packs, coats, pads, beds, outdoor furnishings, and survival tools. Finally, Cabela’s sports an attractive, practical, and comfortable line of affordable casual clothing for men, women, boys, and girls with everything from shirts, sweatshirts, t-shirts, and sweaters to pants, shorts, jeans, gloves, and pajamas. They have rainwear, outerwear, and performance underwear too.